The VL is a multi purpose machine. Each unit may be set up to apply labels, stamps or tabs. It comes on a stand and may be rolled up to the end of an inserter, an address printer or a feeder. 12" diameter by 3" wide roll on a 3" core. You create a simple in line tabber by adding the TF tab folder to the output of the VL. In this application, the VL head is slid to the tabbing position, pieces are fed the long way and either 1 or 2 tabs are applied to the edge of the piece half on, half off. 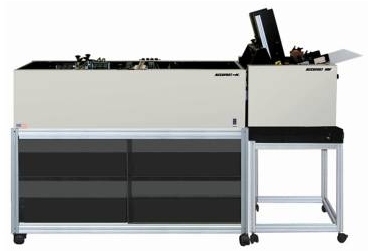 The TF tab folder accepts the output of the labeler, registers the material against an adjustable fence and folds the tab down tight to the edge of the piece. In order to complete the tabbing system, you need a feeder. 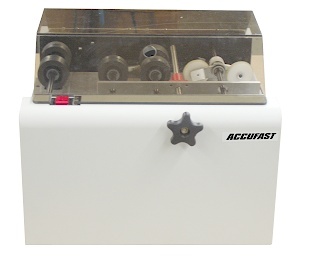 We suggest using an ACCUFAST HDF as shown below. 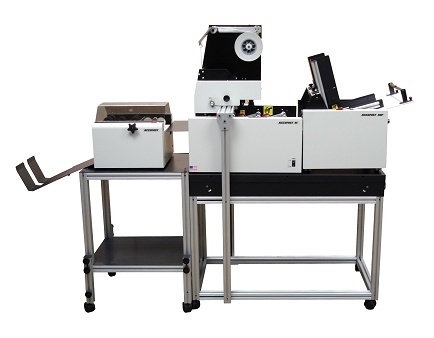 Depending on room, budget or inclination, you can also add a conveyor or an in line ink jet such as the PMx to the system to create a self mailer processing unit that starts with the folded piece, applies and folds the tab, prints the address and stacks it in order of mailing. If the piece is glossy, add a UV cure unit to the conveyor. Power: 110/230 VAC 50/60 Hz 3/1.5 amps. Fan fold or roll labels up to 4 1/2” wide.